We’ve been on a roll lately, talking about cleaning up your living environment and reducing your exposure to toxicants. Everything from cosmetics to laundry detergent to fragrances. But what about the obvious elephant in the room? Don’t let the candid photo fool you, the little Pill we pop every day or IUD we had implanted are actually considered endocrine disruptors (when using the definition set by the World Health Organization). Makes sense, though, right? We are taking synthetic hormones to shut off our ovulation. Our ovulation is controlled by your endocrine system. Thus a synthetic compound that disrupts this intricate system is considered an endocrine disruptor. An endocrine disruptor is defined as “chemicals that may interfere with the body’s endocrine system and produce adverse developmental, reproductive, neurological, and immune effects in both humans and wildlife” (NIH). Sounds like hormonal birth control fits the bill. Other examples of chemicals that are known endocrine disruptors include diethylstilbestrol (the synthetic estrogen DES), dioxin and dioxin-like compounds, polychlorinated biphenyls (PCBs), DDT, and some other pesticides. 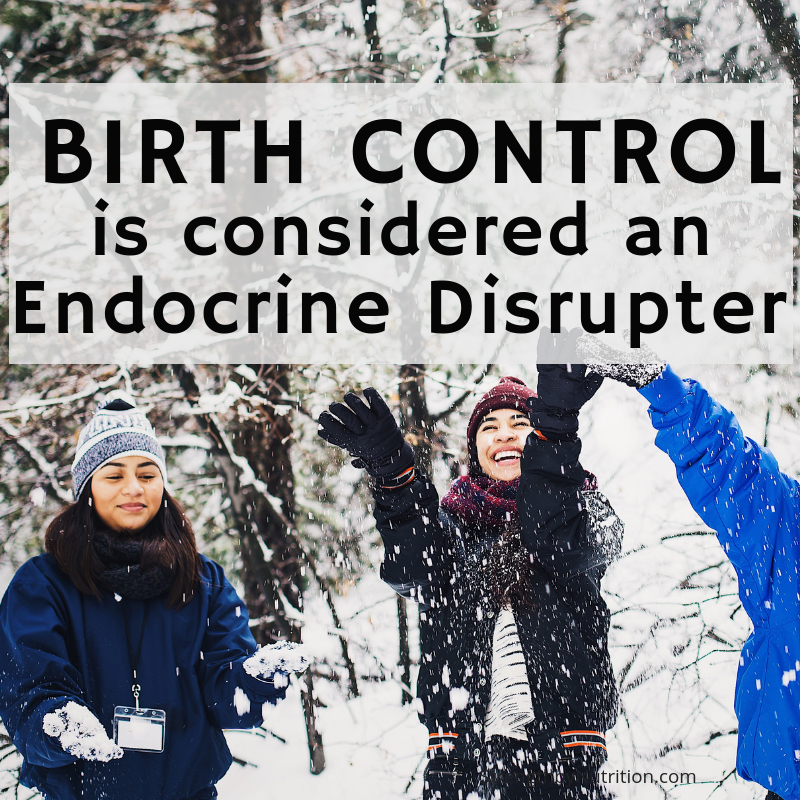 What About Birth Control Makes it an Endocrine Disruptor? The combined oral Contraceptive pill (OC) typically contains 0.02-0.04 mg ethinylestradiol, the synthetic estrogen used in most oral contraceptive formulations, and varying levels of synthetic progestins, a synthetic progesterone used in combined oral contraceptive pills, emergency contraception, the Mirena IUD, and progestin-only birth control pills. In study conducted among 1.8 million women who were followed on average for 10.9 years (a total of 19.6 million person-years), 11,517 cases of breast cancer occurred. Compared with women who had never used hormonal contraception, the relative risk of breast cancer among all current and recent users of hormonal contraception was 1.20 (95% confidence interval [CI], 1.14 to 1.26). This risk increased from 1.09 (95% CI, 0.96 to 1.23) with less than 1 year of use to 1.38 (95% CI, 1.26 to 1.51) with more than 10 years of use (P=0.002) (Mørch). Other risks to consider are essential nutrient deficiencies caused by the pill (including folic acid, B vitamins, Vit C and E, Magnesium, Zinc, and Selenium) which can further affect liver detoxification along with thyroid and adrenal function. The thyroid and adrenals are endocrine glands and produce hormones that affect your metabolism, circadian rhythm and metabolism – not something you want to mess around with. How about Progestins, anything wrong with those? According to a few experts, “Older generation progestins (e.g., Levonorgestrel, desogestel, gestoden, norgestimat), are as derivates of 19-nortestosterone, a common anabolic steroid (Brueggemeier, 2006), which are able to activate androgen receptors and exert androgenic actions (Sitruk-Ware, 2006; Wiegratz and Kuhl, 2006). Who wants to look and exhibit more male features? Definitely not me! Newer progestins (e.g., dienogest, drospirenone) on the other hand, bind very specifically to the progesterone receptor and are anti-androgenic (Wiegratz and Kul, 2006).” I don’t know if I agree with this 100%. Based on my own personal experience, after getting the IUD in May 2017, I developed cystic acne on my face and body along with black stray hairs on face and belly, and gained roughly 10lbs. A DUTCH test confirmed that I had extremely high testosterone levels which were being metabolized down the 5 alpha pathway (extremely androgenic metabolic pathway). Not exactly my idea of a side-effect I am willing to endure. Hormonal contraceptives certainly disrupt the reproductive system and have been associated with increased risk of cardiovascular events, loss of bone density, decreased immune function and, in some studies, increased risk for breast cancer. Metabolic disorders? Recent research suggests that long-acting progestin-based birth control may increase risk in obese women for Type 2 diabetes. Not only should we be concerned about ourselves, but also the impact on the reproductive health of wildlife from the excretion of these chemicals into the aquatic environment. Bottom line, consider our hormonal BC as a potential endocrine disruptor when paving our way to a healthier, cleaner, and safer environment. Need help cleaning up your home? Your Cosmetics? Perhaps consider doing a liver detoxification? Click the links to view our articles.